Do you suffer from headaches and migraines? Drink more water. Insomnia and irritability? Drink more water. High cholesterol and high blood pressure? Drink more water. Low back pain? Overweight? Drink . . . Well, you get the idea. 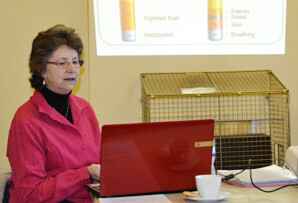 According to Avril Holland, our speaker on Saturday 26th January, drinking more water is the answer, whatever the question. Avril is an experienced nurse, educator, reflexologist and dowser, is passionate about getting the nation to avoid dehydration, and there are plenty of good technical and medical reasons to support her claims. The body is 75% water; the brain is 85% water; and your blood is 94% water. It is therefore vital that we keep our fluid levels topped up. Just 1% short, say three-quarters-of-a-pint, and you will show symptoms. The brain shrinks, albeit slightly, and that hurts, resulting in headaches and migraines, and disrupts brain function and concentration. Insomnia follows if your water levels are down, because the urine in your bladder becomes too concentrated, and causes irritation. So you get up in the night, more than once, and your urine is dark and strong. Drinking more water before bed restores the balance, and you will need to pee less, not more! Low back pain? That’s probably your kidneys working too hard to compensate for lack of water. Drink more and see if it goes away. Dehydration doesn’t just result in feeling tired, lethargic, irritable and anxious. Long-term dehydration risks asthma, allergies, constipation, high blood pressure, type 2 diabetes, auto-immune problems, angina, and obesity. Thirst is your body's desperate plea for more water, and if ignored, turns to hunger. So then you eat the wrong foods - and put on weight. Drink water sooner rather than later, and avoid putting on the pounds. Water breaks down waste products and helps with digestion and excretion; it dissolves the water-soluble vitamins, B, C and D, and transports them round the body. It lubricates the joints. It keeps salt levels under control. It maintains our skin. Avril Holland believes that water is the answer, whatever the question. Photo: Patrick Callaghan. We lose so much of our water intake so easily: sweating, breathing, peeing and poohing. We replace it by drinking - 8 glasses a day is good; we also get some from foods such as fresh fruit and vegetables, which is one of the reasons why your five-a-day is important. It is important too, to drink the right sort of water! Water from the tap is a soup of chemicals such as chlorine and fluoride, hormones, nitrates, pesticides, herbicides, bacteria, sulphates. Right sort of container too - never drink water from a plastic bottle that has been left in the car, because toxins from the plastic will have leached into the water. But if we all drank bottled water, we’d be up to our necks in plastic. The cheapest and simplest is to buy one of those jug filters and keep it topped up. And keep yourself topped up too. Clear teas count; tea with milk and coffee don’t. With all this water, it’s important to take enough salt, which is essential to life. Adults need 6 grams a day, about one rounded teaspoon. But it is a hidden ingredient in a LOT of foods, so be careful not to overdo it. Rock salt in a grinder is best - you have to work to get too much! This wasn't just a life-changing talk. It was a life-SAVING talk.